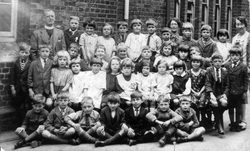 The school was opened in 1875, It was a church school and during the first week about 70-75 pupils were enrolled but the numbers varied a lot as it wasn’t compulsory to attend. The first vicar was Rev. Astley Roberts and according to the notes, was very active in arranging things, especially Religious Education. At one time, some of the boys left to go to Rickmansworth Masters and all the teachers were Mistresses at Croxley Green. Every Summer, there was an exodus of children to go gleaning, the results taken to the old mill opposite the present Rickmansworth School also blackberrying and acorn gathering, I think they paid by the sackful. There always seemed to be a lot of illness in the Winter, measles, whooping cough and ringworm, along with colds and ‘flue. Sometimes the school would be shut for a month or more when the measles epidemic was bad, if the weather was wet or very cold, hardly anyone turned up – I don’t know if it was that they hadn’t much to wear or that they had a long way to come. Religious Instruction was the top of the list, it seems you had to know all about the Old and New Testaments, the Prayer Book and the Catechism. Ascension Day appeared to be the most important festival as everyone went to church then had the rest of the day as a holiday. 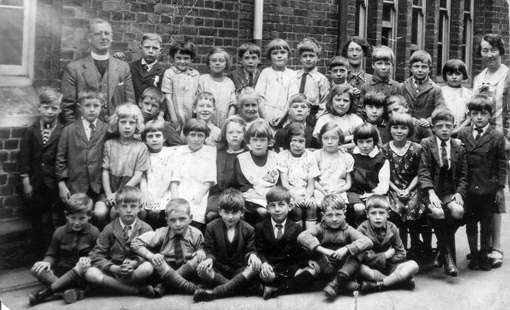 There were always two days off for the Sunday School treats – both All Saints and the Methodist Chapel in New Road. In 1893 there was a scarlet fever epidemic, the school was closed and everything was burnt and lime washed. In 1894 it is reported that one boy died of a dog bite and one boy was sent home for kicking and swearing at a teacher. Each year the Circus came to Rickmansworth and consequently, few came to lessons. Not much is mentioned about the First World War except that Dickinson’s Institute (as it was then called) was turned into a hospital (Now the Guildhouse Flats). Miss Stamford started in 1918, I remember her and in 1918-19 there was a Peace Pageant and in 1920 the playground was tarred. Miss Cooper started and the bill for an outing to The Old Vic to see “As you like it” was – 8d ticket,. Fare to London 1s 1d, dinner 11d tea 8d, total 3s. 2d (16p today). It seems to me that the people of Croxley Green were very poor until John Dickinson built his mill and provided employment. When I was five (1925) I joined the Infants’ School, Miss Dickinson was the Head Mistress until she retired at the end of my second term, the school gave her an armchair and we all danced round it. Miss Coney took her place. When we started, one of the older girls was put in charge of us (mine was Violet Mead) who lived where the garage is now and if we were worried about anything, we had to go to her first. There was only gas lighting and heating was by coal fires, which meant that if you sat at the front of the class you were very hot whilst at the back it was very cold. The toilets were outside which made it very cold to visit them in the Winter. I remember some of the names of the teachers – Miss Cooper, Miss Vincent, Miss Groom and Miss Walker. The vicar was Rev. Blois Bishop and he came once or twice a week for prayers and a talk, we always went to church for special days, including Harvest Festival. We had a longer dinner hour so that girls and boys, whose fathers worked at the Mill could take their dinner down to them. I never had any homework and we only had one special exam at 10 or 11 to see if we could pass to go to the Grammar or Central School. We left school at 14 years old. Dickinson’ management were very good to us, we had the use of the Guildhall for plays and country dancing and the recreation ground was available for netball and other sports. Empire Day was always kept with Britannia, her attendants and flags of all the nations, then the rest of the day was a holiday with the crowning of the May Queen and country dancing in the evening. On November 11th, a few girls went to the Boys School to make laurel chains to hang round the War Memorial, we always went there for a service and 2 minute silence. We went down to Rickmansworth for cooking and housewifery and these classes were held in a big hut where the Council Offices now stand. Of course this was all before the building of Harvey Road and Durrants School. Three generations of my family attended there. The school closed in 1975.